Rice and beans (called arroz y habas or similar in Spanish, arroz e feijão in Brazilian Portuguese) is a very popular dish throughout Latin America and the Caribbean as well as in communities of Latino and Caribbean people elsewhere. 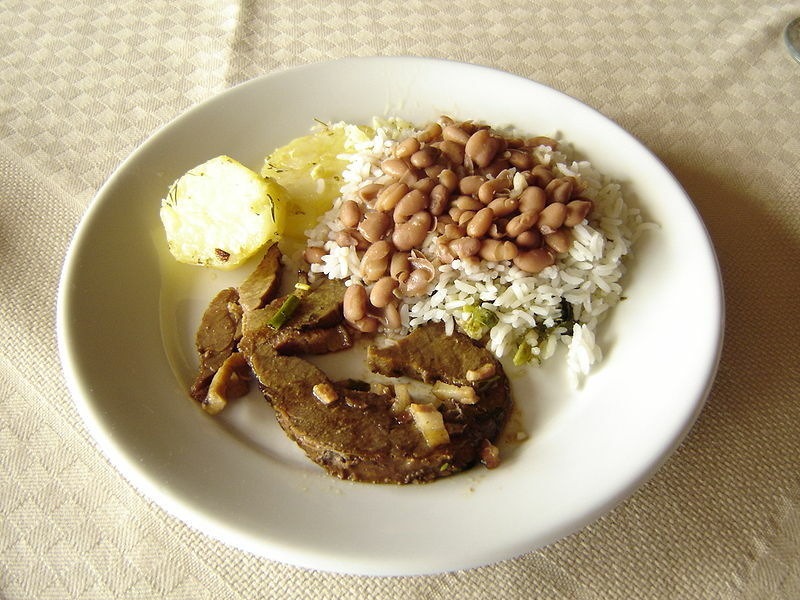 Left: Rice and brown beans, as served in a hotel in the southeast Brazilian countryside. The dish may be accompanied by meat, bread, eggs, vegetables, etc. The dish usually consists of white rice accompanied by brown, red or black, dry beans (typically Phaseolus vulgaris or Vigna unguiculata) and seasoned in various ways. Different regions have different preferences. In Brazil, for example, black beans are more popular in Rio de Janeiro, Rio Grande do Sul and Santa Catarina, while in most other parts of the country these are mostly only used in feijoadas. The New Orleans specialty known as "red beans and rice" is often accompanied by a side of smoked sausage or a fried pork chop. In many areas, rice and beans are often served side by side rather than mixed together. Either way, they may be considered a meal or as a side dish to accompany a main dish of meat or chicken. Meat or other ingredients are sometimes placed atop rice and beans or (less often) mixed into it. Given the basic nature of its ingredients, rice and bean dishes exists in many regions of the world.